Believe it or not, the origin of the Cuban sandwich is actually a matter of some debate: rumors tell of the Cuban sandwich originating in Cuba or Key West, then migrating to Tampa, where it’s popularity skyrocketed. Some say it originated in Tampa, and Cubans leaving the city then brought it to Miami. Regardless of where this sandwich was born, there is one thing everyone can agree upon – the Cuban sandwich is absolutely delicious! The first recorded mention of the “Mixto”, as the Cuban sandwich was first known in Tampa, was in the 1890’s, when it became popular as a quick meal for cigar workers on their commute to and from work. The yummy sandwich underwent several modifications over the years as immigrants from different countries settled in Ybor City. The Cuban sandwich, like the city, is a mixture from different cultures and their best foods. From the Cubans, we get the mojo-marinated pork, and the Spanish brought ham into the mix. The German and Jewish contributions are the pickles, mustard, and of course, the Swiss cheese. Now, there is some disagreement on whether or not to add salami. Because of the many Italian immigrants who settled in Tampa, Genoa salami became a popular add-on to the Tampa version of the sandwich – however, this ingredient is left out in the South Florida versions. No mayo, tomato, or lettuce (unless you insist, but just know it is frowned upon by Cuban sandwich traditionalists!) But most importantly, no good Cuban sandwich can be made without good-quality Cuban bread. All of these delectable ingredients are then carefully assembled and, of course, pressed. Pressing the sandwich is key – not only does it toast the bread and melt the cheese, but it warms up all the meat and helps render some of its juices, making this sandwich incredibly tasty. If you haven’t had one, you should! 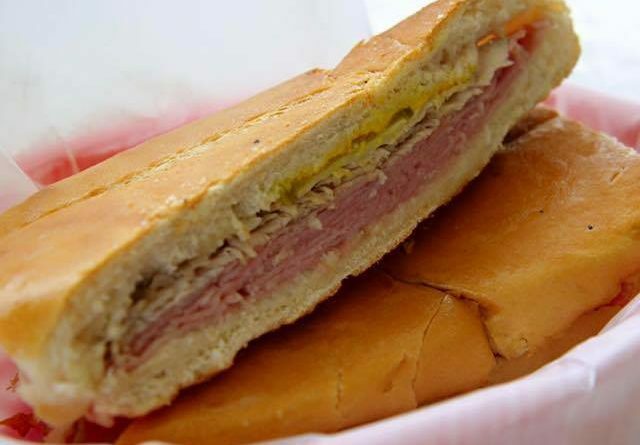 And there is no better place to try this well-known sandwich then at La Sorpresa Latina Cuban Café in Naples FL. Be sure to pay us a visit and experience an authentic Cuban sandwich, along with many other traditional Cuban dishes, while enjoying a little piece of classic Cuban culture at the same time.